In the fall of 1942 Bill Hopkins, age 17, was turned down by a recruiting officer when he tried to enlist. Undeterred, he went for lunch and a pint, returned that afternoon, andwas passed through by the same harried recruiting officer. 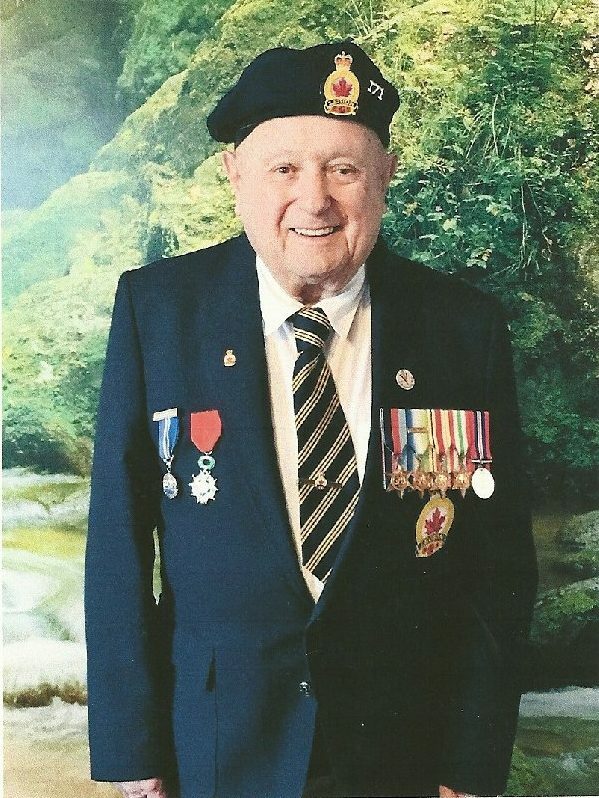 Seventy-three years later, just shy of his 90th birthday, Hopkins cheerfully sat down in the Ladysmith Branch of the Royal Canadian Legion to share his experiences frombefore, during and after the Second World War with the Chronicle newspaper. What emerges is the biographical sketch of a man who never accepted ‘no’ as the final word, and whose stint in the Royal Navy as an able bodied seaman aboard the troop carrier HMS Eastway was a formative chapter in his life’s story. The Eastway – originally dubbed The BatHeaxe when she was launched May 21, 1943 in Newport News, Virginia – was a Light Service Dock or Dock Landing Ship. Her job was to carry soldiers to invasion points, deploy them in landing craft, then pick up the landing craft after a battle was over. “We would sit about a mile offshore, or wherever it was calm enough, and then flooddown and open the gate and they would just take off,” Hopkins recalled. ‘Flooding-down’ was a process where the stem of the Eastway was lowered, admitting sea water into a bay so landing craft carrying troops and equipment, could be launched or docked at sea. She joined in the 0 -0ay Juno Beach invasion of Normandy on June 6, 1944, a pivotal battle, named Operation Overlord, that established the Allies in Western Europe with a force of six infantry divisions -156,000 soldiers plus armored units. Hitler found himself fighting on three fronts after 0-0ay, with the Russians attacking from the east; Allied forces coming up from the south, through Italy; and now a new Allied front opened up in the west through France. 0-0ay didn’t come off without a major hitch, Hopkins recalled. The HMS Eastway was assigned to ferry sappers to Juno Beach to secure it and prepare it as a conduit for Allied forces pouring into Europe. But the forces of nature did not cooperate. “Because of the bad weather they postponed invasion day. It was supposed to be on the first of June, but they postponed it until the sixth,” Hopkins recounted. A fellow vet at the Chemainus sawmill where Hopkins worked for 25 years after emigrating to Canada, used to rib Hopkins about the delayed landing. “You were the guys who kept the sappers out, so we had to do all the bloody work,” Hopkins’ coworker groused. “He gave me a bad time,” Hopkins chuckled. Important as that crowning episode was for Canadian and Allied forces in Europe, it’s the comradery of life aboard the HMS Eastway that stands out in Hopkins’ memory. Uke just about all of his crew, Fletcher was not a career navy man. “He owned a butcher shop in Uverpool,” Hopkins recalled. Hopkins remembers a confrontation in Fletcher’s hometown that showed where the skipper’s loyalties lay. Because American military personnel had more money, and would pay a better price for drinks, bar owners often favored them at the expense of the Brits. For Hopkins and most of his shipmates military service was a chapter. not the book. When he was ‘demobbed’ he went into business as an auto mechanic; he emigrated to Canada in the late ’50s, where he worked for a while as a plumber, and eventually -when business took a turn for the worse- in the Chemainus sawmill, where he put upwith occasional ribbing from his fellow vet. He is now retired in Ladysmith, and has plenty of good stories to tell.